Thank the Lord for him in a general way but for specific items. Pray that the Lord should enable him to plan every day in advance and that the plans should be God-directed. Pray that he should plan the day of tomorrow today and that there should be a clear goal to be accomplished. Pray that he should keep to the plan for today and labour to ensure that the goal set for today is attained. Pray that he should write down the plans and in the evening have the courage to face them for evaluation. that he would obey the Lord in the things that He spoke to him about. he should be burdened to pray more. Thank the Lord for his job and all the income he has earned in the past. Thank the Lord for his previous professional performance. Be very specific. Pray that the Lord should enable him to put on and maintain the attitude of a servant at his place of work. Pray that he should be loyal to his boss, obedient and respectful to all his seniors and kind to his juniors. Pray that he should work very hard, so that the Lord may be glorified in his professional life. 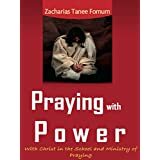 Pray that he should not do Christian work instead of his professional work at his place of work, so that his salary should be justifiably earned. Pray that the Lord should enable him to make a distinct professional contribution. Pray that as the Lord opens the door, he should witness to his colleagues and win them for Christ. Pray that he should not be persecuted, unless the Lord has designed it to be so, because of his faith. Pray that he should be promoted when he deserves promotion but that he should not be moved by elevations in the world. Pray that he should have professional fulfilment at his job. he should bear with her faults and weaknesses and help her to overcome them. he should be fulfilled as a father. he should be fully aware that he may be called up by the Lord that day to give an account of his financial stewardship. he should sacrificially put in his all: time, money and energy into the call of God on his life. the Lord should deliver him from the fatal sin of pride. enable him to co-operate with Him for his deliverance, so that his weaknesses can be taken away. Pray that he should see the gravity of each of these sins before the Lord. Pray that he should have an intimate relationship with the Holy Spirit; so that he should be deeply convicted, should he fall into any. Pray that when convicted he should repent immediately and genuinely and seek the Lord’s forgiveness and restoration. Pray that he should be filled with the Holy Spirit daily; so that he should know a continuous walk in purity. his attitude to the self-life in him. Praise the Lord for having enabled you to pray for him.